Under the surface of the water - that's where you'll find huge winning chances when you spin Mr. Sloto's newest game: Megaquarium. 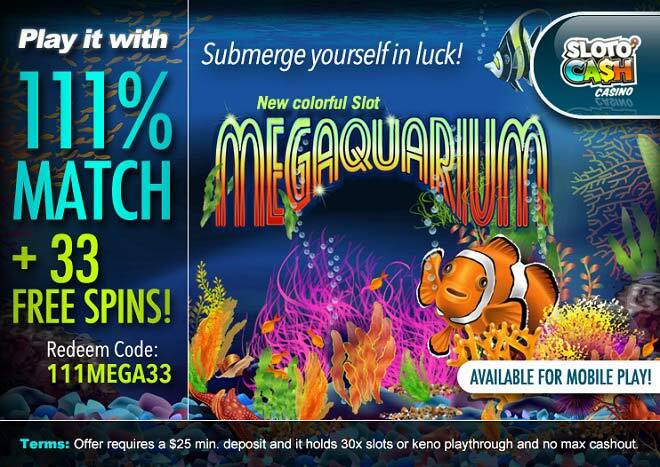 The 5 reels of Megaquarium can be spun from your desktop or mobile device with a 111% Match plus 33 Free Spins when you make a deposit of as little as $25. Spin for underwater wins alongside schools of colorful fish that will help you amass wins in the form of free spins and bonus games. Land the doubling Wild Clown Fish on reels 2 and 4 for extra wins. The Free Games symbol appears on reels 1 and 5 and grants 7 free games with prizes doubled. More subaquatic wins are waiting to be claimed when you deposit $25 to play with a 111% Match + 33 Free Megaquarium wins!